The bathroom for men and ladies share the big wall painting of Mt. Fuji. The left wall divide men's bath. 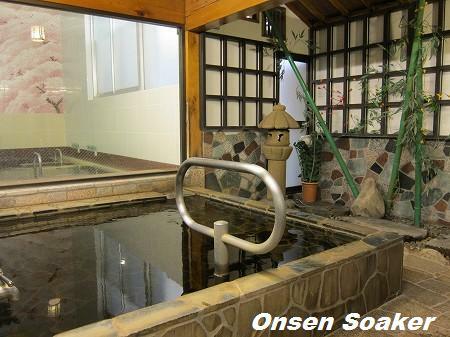 Even if you're on a business trip to Tokyo and too busy to visit countryside of Japan, you can try onsen soaking in Asakusa, one of the major tourist traps in Tokyo. 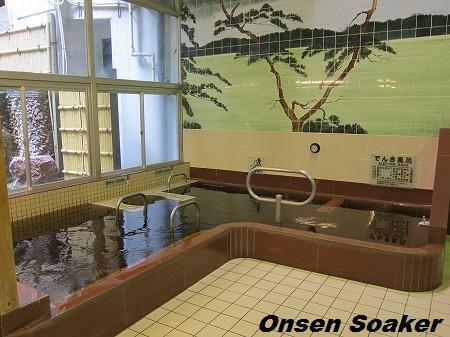 I wrote a post on the "Asakusa Kannon Onsen" in 2009 (see my post dated Apr. 24, 2009), and following is a complete guide of the another onsen, the "Jakotsuyu",　finished renovation in Dec.2009and highly recommended. 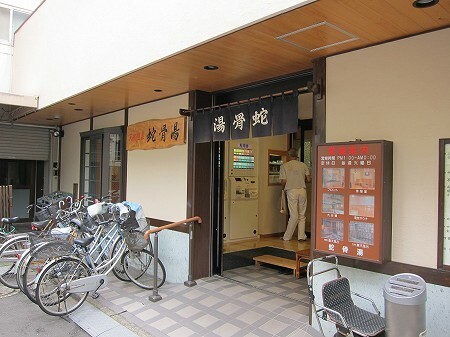 The Jakotsuyu" is a Sento - the public bath mainly for local residents but welcomes everybody; young and old, men and women, with or without tattoos. First hurdle is finding it. You can't see the Jakotsuyu itself on Google Street View as it faced on a narrow alley a car can't enter. I almost get lost whenever I visit. See the linked map below before starting and search left side of the "MacDonald Asakusa ROX Branch" very carefully at the spot. 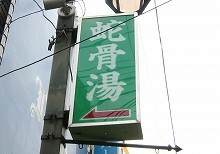 You'll find green small sign written 蛇骨湯 (Jakotsuyu) in white. You can see this sign on the Street View. A part of the vending machine. Read carefully and buy tickets you need. On arrival, remove your shoes at the entrance, put them in the shoes locker, then buy your bathing ticket at the vending machines. Don't worry. 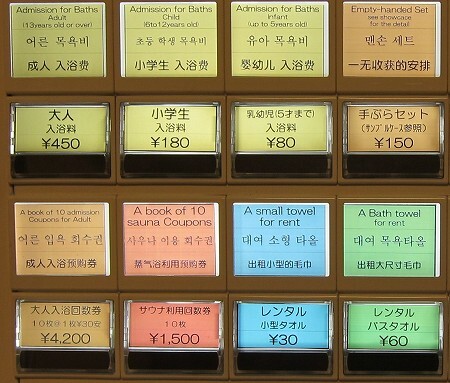 They carry multilingual signs; in Japanese, English, Chinese and Korean. If you need a soap - there are no complementary soaps there, and towel rent/buyout, or use of the Sauna Room, buy the additional designated tickets at the machines. Actually you don't have to bring anything for bathing. They sell "empty-handed set" consists of shampoo, soap, razor, hand towel. The dressing room for men. It's rather new as renovated in late 2009. Keep your key on your list all the time. Proceed to the gender separated dressing rooms. Put your clothes and belongings in a locker, and keep the key with you all the time. Enter the gender separated bathroom in your birthday suite. 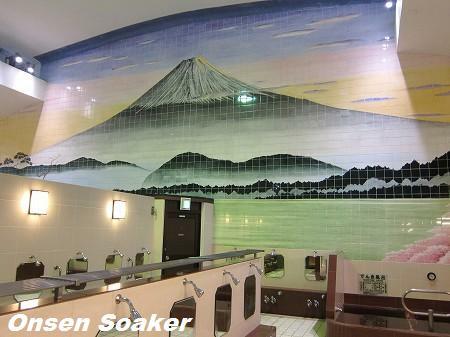 The bathrooms are typical sento (public bath) style with big wall paintings of Mt. Fuji. The big difference is the hot springs - accurately heated natural mineral springs, each bath tub including cold water bath are filled with mineral springs. They are slightly brow/bronze, and very smooth. Shower water is also mineral springs. Semi open-air bath for ladies. Space of the semi open-air bath for men is bigger. 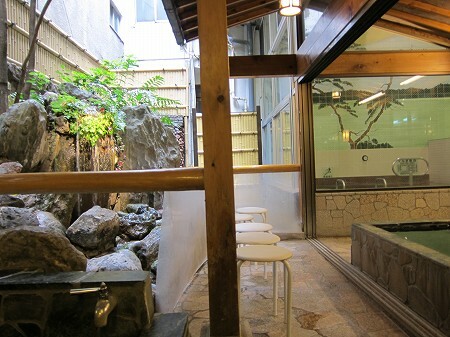 There is a tiny Japanese garden at the semi open-air bath for men only. Washing space. Tap with red sign is hot water, blue one is cold water and the one without color is for the shower. The showers above the mirrors are installed to the walls. Help yourself washing bowls and stools. Admission fee: ¥450 for adult, ¥180 for 6-12 year-old, ¥80 for below 6 year-old. 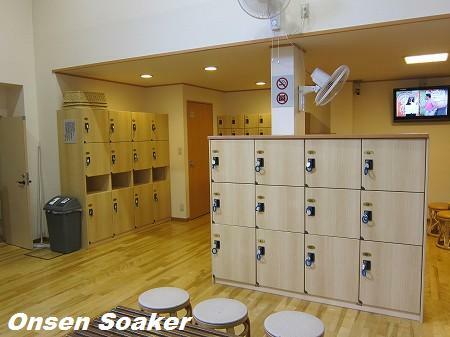 Equipment: Washing bowls, stools, lockers. There is an internet connected PC (you can use 15 minutes maximum) and iPhone charger at the lounge. Access: Within walking distance from Asakusa Station ,Takawamachi Station, Senso-ji and other main tourist spots of Asakusa. This post is written with full cooperation of the Jakotsuyu. If you have any questions, feel free to leave a comment. It's just great that you get to go to little onsen like this place almost anywhere in Japan. Terrific public bath, loved the brown mineral water, felt like I was bathing in a pool of English Breakfast tea! Took a while to find, but the key is to look for the McDonalds across from the Pronto Coffee Bar, and then to look for the green sign with the white kanji around the corner. Thanks for the post! We really enjoyed visiting jakotsuyu. It's clean and modern and the mineral water is fantastic. Very relaxing and a wonderful cultural experience. Indeed tricky to find. After searching for it for a while, the information bureau across the street form the Asakusa main gate gave us a map (and provided information on two other onsen options). We had no problem finding it with their help. We visited here in 2005 and it was a wonderful experience. The staff were very helpful, even to we Aussies with very little Japanese, and it's a very relaxing and enjoyable experience. The prices are almost the same as they were 10 years ago. 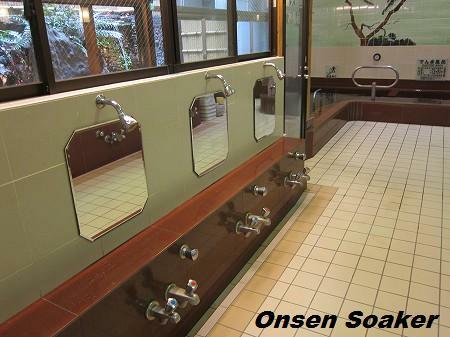 The mens semi-outdoor bath is very beautiful in its setting, and it was an experience we would recommend to anyone staying in Asakusa as a "Must Do". It's easy to find too - there's a very detailed map at http://www.libertyhouse.gr.jp/access.htm with the Jakotsuyu 'Hot Springs' listed with a little tub symbol with steam rising from it. We are going back in 2018 and very much look forward to visiting again. 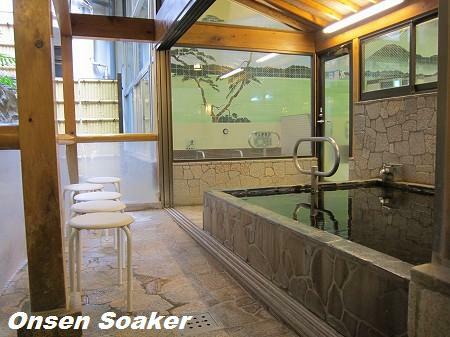 This is a fantastic onsen especially for foreigners with tattoos. The unfortunate truth about Japan is there is still a negative social stigma surrounding tattoos due to Yakuza gangs. Fortunately some businesses like Jyukotsuyu are becoming more accepting of tattooed individuals. So it's ok to get in this even if you have big tattoes? I'm looking for a place that accepts. Paulo Prado, don't worry. No problem at all. My friend and I have both a sleeve, so our whole arm is full with tattoos and we want so badly to visit an onsen. I have a tattoo on my ankle as well. one of my tattoos is a sugar-skull (mexican symbol to worthy and celebrate the death)... so that won't be a problem as well? We will be staying in Shinjuku and the little journey through Tokyo wouldn't matter to us at all if we really can visit an onsen. Ronja Kubik, most of Japanese including myself don't know a sugar-skull, and it makes no difference at all. Enjoy Jakotsuyu! Been there on July 2017, and they now have complimentary shampoo and body soap. No need to buy the extra soap for 40Y anymore.